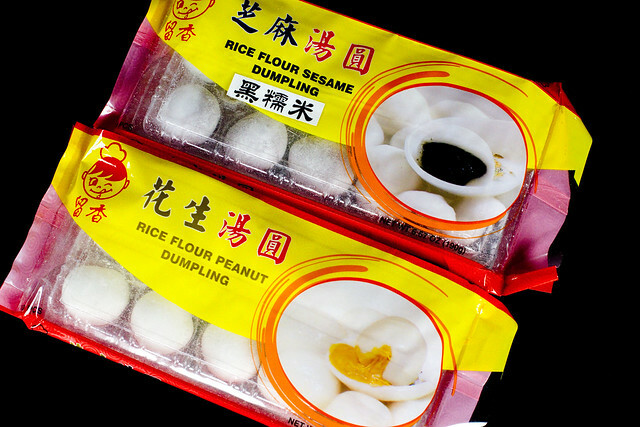 There’s two main types of tangyuan (dumplings made of glutinous rice flour): the small (or mini) tangyuan pictured above and the large filled tangyuan pictured below. Both are sold frozen year-round at the Chinese supermarkets. The small ones, which are bouncy little balls, often come with a few pink ones — died with food coloring — that I usually discard, but I left them in for the pictures in this post. You can often fit 3 to 4 little minis in each spoonful and these are usually served in a soup that has egg drop. If you eat the larger ones in one big mouthful, you’ll notice that they tend to be slightly softer and a nice sweet filling will ooze out, and so the soup does not include egg drop. The most common fillings are sesame, peanut, and red bean paste. Some of these look purple because they are made with the black (looks like dark purple) glutinous rice. Bring water to a boil in a small pot. 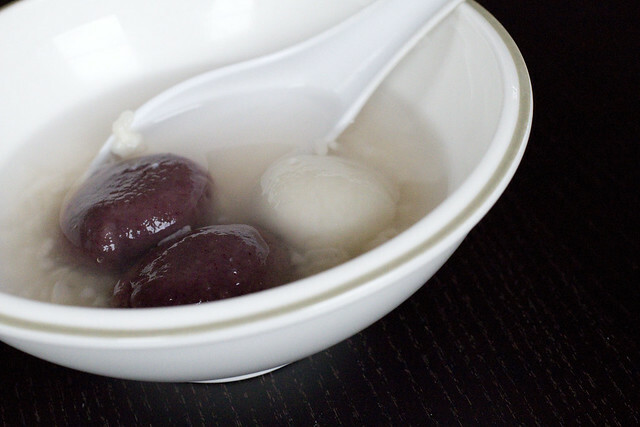 Add frozen tangyuan and bring back to a boil. 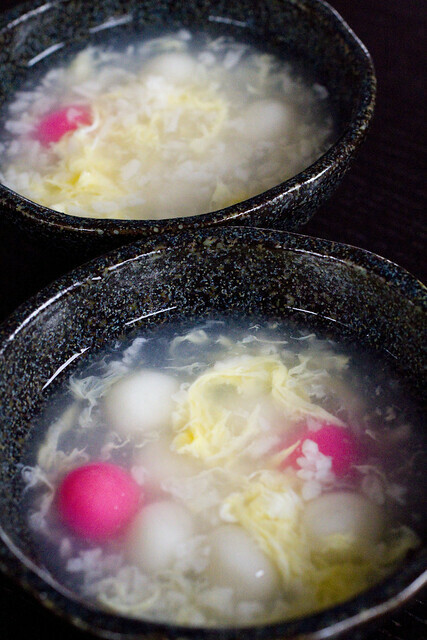 Reduce the flame so that the water doesn’t boil over and cook until the tangyuan are floating, about two minutes. Stir in fermented sweet rice and bring back to a boil. Reduce to a simmer and stir in sugar. Add more sugar to taste. Serve immediately. Bring water to a boil in a medium sized pot. 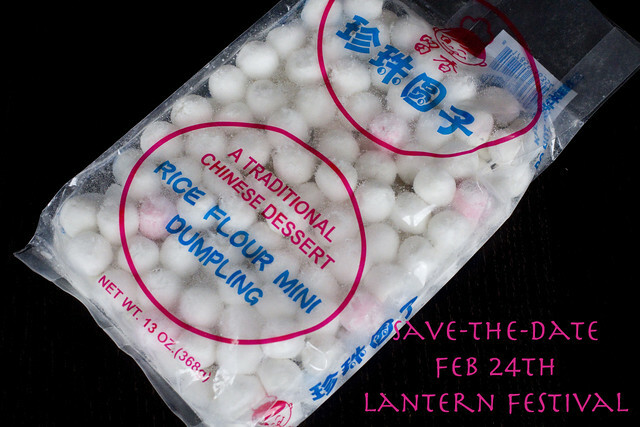 Add mini tangyuan and bring back to a boil. Reduce the flame so that the water doesn’t boil over and cook until tangyuan are floating, about two minutes. Stir in fermented sweet rice and sugar, then bring back to a boil. Reduce flame so that water is simmering. Stir in egg a little bit at a time while constantly stirring. Add more sugar to taste and serve immediately. posted by jessica	at 01:03 PM	Filed under Chinese, Desserts, Recipes. You can follow any responses to this entry through the RSS 2.0 feed. Both comments and pings are currently closed. I love learning about your culture and the recipes sound delightful. What is fermented rice and is that also available in Asian markets? Thanks Leesie! The fermented sweet rice is glutinous rice that has been fermented. It is available at Chinese supermarkets but I’d like to post a how-to as well for making it at home….stay tuned! Thanks Jessie! Has “pinning” been easier? I think most pics can be pinned now right? Yes, pinning has been easier. Thank you! Made some long life noodles with shrimp and bok choy for New Year. Will need to try the filled dumplings this weekend. I never knew they could go in soup! Awesome Jessie! I’m glad you are celebrating in style! mini tang-yuan are super easy to make yourself if you don’t feel like buying them (and having to discard the pink ones). I don’t have the exact proportions, but it’s just glutinous rice flour and water until a semi-soft dough forms, and then roll them out into little balls. plop in your soup of choice, and you’re done! Soopling, good to know! That might be a really fun activity for Caya for next year. Happy New Year! Your soups look delicious. Honestly, my mom brings it to me but I’m pretty sure it’s available at any of the Great Wall supermarkets or Hong Kong supermarkets. Are you in NY?